Below is an outline of basic winter preparedness checklist for producers to review. This check list will help you prepare your dairy for the winter season ahead and be beneficial as you put your winter preparedness plan into action, while simultaneously making those cold winter mornings less stressful. Make way for snow removal: Pick up any items from the yard that may become buried under a snow bank or entangled in the snow blower. Snow fence: Put up an appropriate snow fence or snow break in yards for protection and to minimize drifts in areas where they are not wanted. Fix muddy areas: Consider bringing in any necessary fill or mounding areas that become muddy or troublesome spots in the spring. Check curtains on barns to make sure they are operating properly and repair any holes or tears. Check and maintain ventilation fans including tightening belts and keeping blades and louvers clean. Look upward, inspect and repair building roofs and rafters, making sure there is no loose tin or cracked rafters present. Maintain and repair any doors in barns that may not open or close properly. Check and clean barn heaters to make sure they are operating properly. Outside the facilities, do preventative trimming of trees around barns, driveways and fences. So what are some things to consider regarding winter equipment maintenance and preparation? Test and service your generator(s) and make sure there is adequate fuel on hand to run them. Winterize and service farm equipment such as tractors, semi's, skid loaders, pay loaders, feed mixing wagons, manure pumps, etc. Take time to check anti-freeze levels, batteries and fuel filters as these items routinely cause issues in cold weather.Keep extra fuel filters on hand for equipment that uses diesel fuel and may gel up in extreme cold. Examine snow blowers or other snow removal equipment and make sure it is in proper working order. Have adequate feed supplies moved in for easy access to the farm. It is recommended to have a two-week supply of purchased feedstuffs. As we examine the shelter and health side, what is necessary to keep the animals healthy and protected on the dairy? 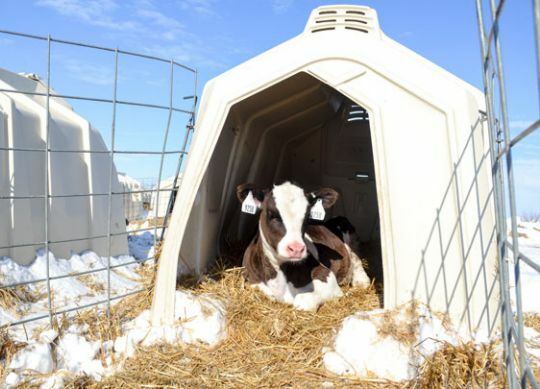 Evaluate shelter for livestock in open lots, making sure there is adequate wind protection and the ability to get bedding pack built up for them prior to poor weather. Develop a plan with milk haulers and milk buyers for options if milk is unable to be picked up for an extended period of time. Partner with neighbors and develop a plan if it is necessary to do your own snow removal on public access roads.